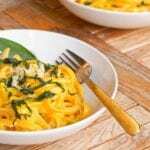 Vegan Pumpkin Pasta is made with pumpkin and coconut milk & makes for a quick and simple fall themed weeknight dinner. Gluten Free and low in fat. No heavy cream necessary for a rich and velvetty pasta sauce. Vegan Pumpkin Pasta is all I have on my mind now that it is officially September. It is pumpkin time. Can you believe it that for years and I mean years I would not give pumpkin a chance. Tried it once, hated it and I was done. For years pumpkins were solely reserved for Halloween – for carving or just for decoration. I would not go anywhere near a pumpkin related recipe. How sad is that? How could I be such a close minded food fanatic?! I needed to give pumpkin another chance years ago! All that wasted time not eating delicious pumpkins recipes! Luckily years later I came around, and decided to give sweet potatoes (in the form of a sweet potato chickpea salad, Whipped Sweet Potatoes and sweet potato tofu burger) another shot, as well as pumpkin. Well, let’s just say it was love at first bite. Don’t mind the corniness – I had to! Seriously though, how was I living without sweet potatoes and pumpkin for all that time? They are both incredible and wonderful and healthy and nutritious and just about everything good out there. Pumpkins simply define fall and all that comes with it. 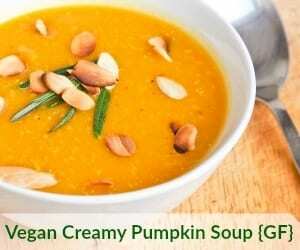 The scent of oven roasted pumpkin or the creamy hot aroma of a vegan pumpkin soup just warms you through and through. Pumpkins just are fall, one is synonymous with the other, and especially a New England fall. Something specifically about the gorgeous changing of the leaves and all those colors has pumpkin season on everyone’s mind. It’s no surprise the whole region goes crazy for pumpkin beer that time of year. I wanted to go in a different direction with pumpkin this time though. Not just oven roasted veggies or creamy soup. I wanted something more. Pasta with a creamy pumpkin sauce it would be, so hello creamy vegan pumpkin pasta. 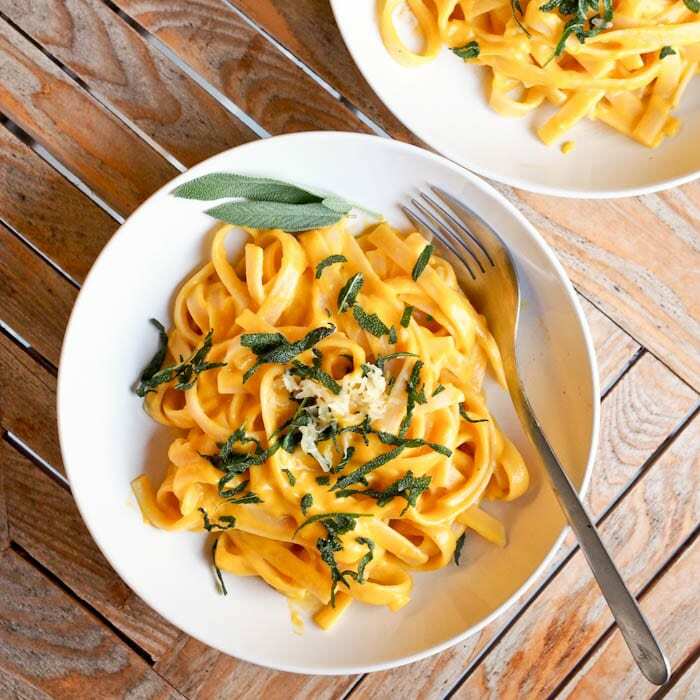 For this vegan pumpkin pasta all you’ve got to do is boil the cubed pumpkin and then puree it and that is the real gem in this recipe. 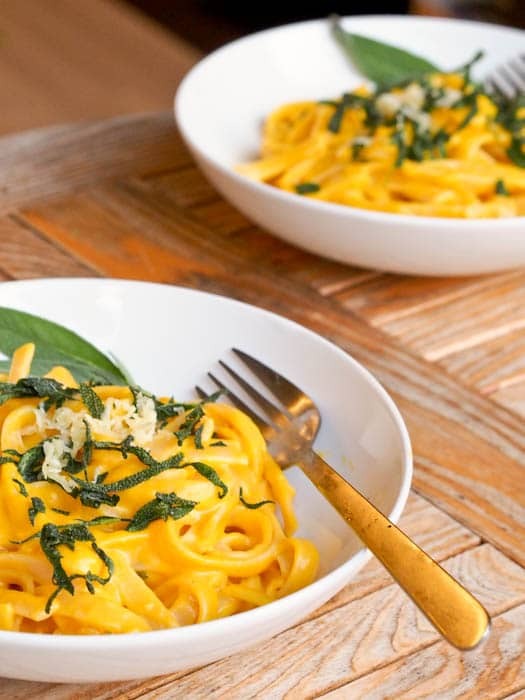 That heavenly dreamy pumpkin puree is what coats the thin pasta noodles. Of course there’s a bit of garlic, coconut milk and sage thrown into the mix as well – but those are easy to get your hands on. I imagine fresh rosemary would work wonders here too, but I think sage is a highly underrated herb and needs for time in the spotlight. And sage is also perfect for fall and embodies all those fall seasonal flavors. And if you want to take things a step further, roast those pumpkin cubes instead of boiling them — now the caramelized baked cubes turned into a sauce will be the ultimate perfection. Trust me, I’ve tried this recipe both ways and if you’ve got the time, roast that pumpkin! So if you really want to take this vegan pumpkin pasta to the next level – roast instead of boiling the cubed pumpkin. If you want to jazz up the recipe a bit add some other veggies to the sauce, or if you aren’t sticking to a vegan diet, throw in some cheese, or some protein. For me though this dish is just perfect being vegan and gluten-free. A simple pumpkin based pasta sauce with garlic and sage. A quick fall themed dinner ready in under 30 minutes. For a bit more cheesey flavor feel free to sprinkle some nutritional yeast on top or vegan Parmesan. So I hope your next weeknight meal is going to be this creamy vegan pumpkin pasta (because I know mine will be). And if you want to continue with the pumpkin theme be sure to make my vegan pumpkin cheesecake or vegan healthy pumpkin cookies for dessert! Heat oil in a pan over medium heat and lightly pan fry the sage leaves until aromatic and just starting to get darker. Remove sage leaves and drain on paper towels. Add pumpkin puree and mix with the garlic. Add pasta to the pan and mix. Serve topped with sage leaves. Thanks! I know — not sure how I lived all those years thinking I hated both pumpkin and sweet potatoes! So funny that you used to eat chunks of raw pumpkin. I actually used to eat pieces of raw potatoes when I was little! Mmm sage AND pumpkin? What a great fall meal. I am adding this to the meal plan for next week for sure! Thanks so much! I never cook with sage but randomly bought some at the store and it was perfect paired with pumpkin! Thanks so much! I too had drastically changed my mind about pumpkin and am so excited to go crazy with pumpkin recipes this fall! Your Pumpkin Sauce for this Pasta will be delicious! Hope you are having a great weekend and thanks so much for sharing with Full Plate Thursday. Yum! Pumpkin sage are a natch made in heaven! I am featuring your recipe this week on Allergy Free Wednesday, thanks for sharing it! Just found that out myself : )) Definitely a great match. Thanks so much for featuring my recipe! I have this at least once a week! it’s a great sauce for risotto as well! This looks amazing. What a great combination of flavors and spices. Thank you so much for linking up at Simple Meals Friday! I’ll be sharing this on Facebook and pinning it soon! This recipe was soooo good. I added some kale to the garlic when I sautéed it to add some bulk and greens. YUM, I need to make this! Thanks for linking up at our Gluten Free Fridays party! I have tweeted and pinned your entry to our Gluten Free Fridays board on Pinterest! 🙂 I can’t wait to see what you share this week! Its LIVE! This went over amazingly tonight with a large group of non vegans. Lots of second helpings! I added a Tablespoon of white wine vinegar per the ratios listed in your recipe for a little acidity. Thank you for sharing! Made this last night with some kale (bobby flay’s kale recipe verrry good). My son didn’t like it but he doesn’t like anything. Might saute an onion with it next time. I used spiral rice noodles. The kale really went well with this. Will definitely make again:-) tonight I had leftovers and added cayenne pepper, garlic powder and dried minced onions – also added some more pumpkin and coconut milk (canned Lite) – and some more veggie broth – super good. So glad you liked it! Love hearing the additions to the recipe. Spiral rice noodles sound good with this too! You mentioned 25 sage leaves? Can I cut that by half? Of course. Feel free to use the amount you would like. I want to make this for an office potluck. 20 people. I see that this recipe is for 2 servings. Should I really multiply these ingredients 10 times? Hi Robin I think you could probably multiply the recipe by 6 or 7, and even less if there is going to be a lot of food there and people will be eating a little bit of this and that. I think of a solid serving of pasta as 3 ounces – a full meal, though 2 could be a nice plateful, and 1 ounce could be enough for a light plate so if there will be a lot of food I would count on each person having 1-2 ounces of pasta in which case multiple the recipe by 4-6. Hope that helps! Hope the potluck goes well! Absolutely love this recipe!! So simple and the flavours go together perfectly. I used it with some gnocchi instead of pasta and it was wonderful. Also roasted the pumpkin seeds that i cut out of the pumpkin and tossed them through at the end for that extra bit of crunch. 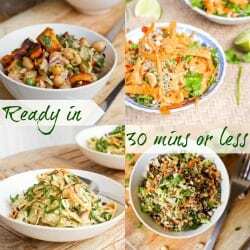 Will definitely be adding this to my list of quick and easy weeknight recipes, thankyou! I’d pour this over EVERYTHING… Even a hot man! LOL! Unfortunately I do not accept guest posts on my blog currently. Would I be able to use soy milk instead of coconut cream/milk? I am not sure how well this would work with soy milk since it is not as rich and creamy as coconut milk. If you do use soy milk I think adding a bit of cornstarch to a small amount of the milk and then adding to the sauce would help thicken it up a bit.